Neben LG präsentiert auch Samsung auf der CES einen "Curved Ultra HD"-Fernseher im 105 Zoll-Format. Der Samsung bietet ebenso wie der LG eine Auflösung von 5120 x 2160 Pixeln im 21:9-Format. Noch offen ist, wann und zu welchem Preis das Gerät in den Handel kommen soll. 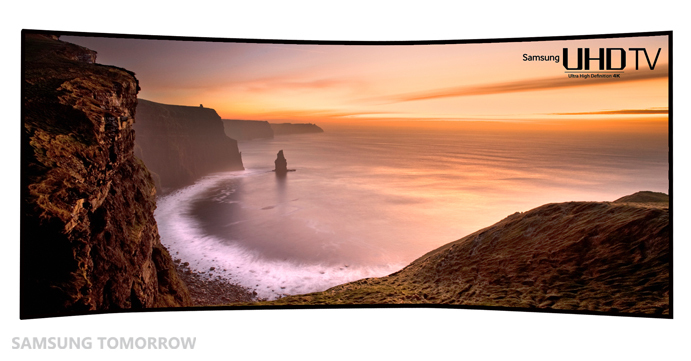 Samsung Electronics announced that it would be unveiling the world’s first, largest and most curved 105-inch Curved UHD TV at CES 2014. Earlier, Samsung showed off its advanced technology by unveiling the world’s first UHD TV at IFA 2013. Now, the company will prove its undisputed technology leadership in the global TV market by showcasing its 105-inch Curved UHD TV at CES 2014. The Samsung 105-inch Curved UHD TV adopts a new proprietary picture quality algorithm that delivers optimized color and greater feeling of depth. As the curved panel has been further upgraded and TV circuit technology has been added, the combination of the upgraded curved panel with a greater picture quality engine provides the ultimate immersive experience. As Samsung’s 105” Curved UHD TV is the world’s most curved, it provides almost two times vivid images when viewed from the side and the best possible TV viewing experience from any angle. Also, the 105 incher adopts ‘Quadmatic Picture Engine’ which delivers all content in UHD-level picture quality no matter what the source is. Samsung’s 105-inch Curved UHD TV boasts an 11 million pixels (5120X2160) screen resolution with a 21:9 aspect ratio.